Under CEO Matthias Mueller -- who was talked into taking the top job in the chaotic days following the public disclosure of the diesel cheating -- VW's profit margin climbed to 7.4 percent of sales last year from 6 percent in 2015, when the crisis hit. FRANKFURT -- Volkswagen Group's board abruptly ended the tenure of CEO Matthias Mueller, a caretaker who revived the carmaker after its worst crisis on record, turning instead to a leader who can implement deeper changes, people familiar with the matter said. Key stakeholders came to the conclusion they couldn't afford to wait two years until Mueller's contract expired to appoint a fresh CEO, as they deliberated an overhaul that will likely include a partial IPO of the heavy trucks division and how best to rapidly implement those changes, said the people, asking not to be identified discussing the private talks. The 64-year-old Mueller, a reluctant CEO who had grown weary of the regular grillings by board members, responded during the talks by signaling he was prepared to step aside, they said. With Mueller agreeing to go, the controlling Porsche-Piech clan, the state of Lower Saxony and powerful labor leaders quickly settled on Herbert Diess, chief of the namesake brand, as the successor, ruling out other top executives such as the CFO, the heavy-trucks chief and Porsche CEO, the people said. None of these behind-the-scenes deliberations were apparent from VW's surprise release that was as short as it was cryptic when it landed on Tuesday afternoon. Mueller had signaled his "general willingness to contribute to the changes,'' the statement read, and that the board was considering changes that included the position of the CEO. It didn't identify Diess as a possible successor, and the company declined to comment further. In tapping the 59-year-old Diess for the top job, Volkswagen would elevate a senior executive from its own ranks, while handing the reins to someone who was not at the automaker when the diesel cheating began. Diess joined VW from German rival BMW in mid-2015, shortly before the scandal erupted publicly. 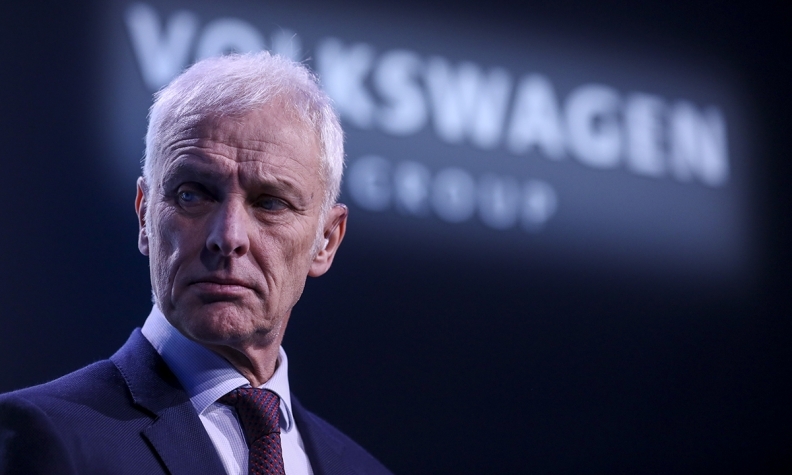 As the executive overseeing VW's biggest unit, he has routinely butted heads with labor leaders while seeking to cut costs and simplify the automaker's byzantine structure. He was selected in fact for his ability to push through changes at the VW brand that boosted profitability and ultimately saved jobs, the people said. VW's statement didn't specify whether the planned changes meant replacing Mueller or simply a shift in responsibilities. It said Chairman Hans Dieter Poetsch will spearhead the transition, and that there is no certainty that personnel changes will in fact occur. The supervisory board will meet on Friday to discuss and likely sign off on the management reshuffling and other proposals, the people said. Under Mueller -- who was talked into taking the top job in the chaotic days following the public disclosure of the diesel cheating -- VW has weathered the blows from the scandal while embarking on an aggressive expansion into electric cars. Its profit margin climbed to 7.4 percent of sales last year from 6 percent in 2015, when the crisis hit. The automaker also managed to fend off Toyota Motor to retain its status as the world's largest automaker. In the aftermath of the diesel-cheating scandal, Mueller sought to overhaul Volkswagen's rigid top-down management structure, delegating more responsibility to its brand and regional chiefs. The complexity extends to its main shareholder, Porsche Automobil Holding SE, where Poetsch works as the CEO and Mueller as a top executive. Porsche said in a separate release that any changes at VW would be reflected in its management. Including Mueller, VW's management board totals nine people, with responsibilities ranging from purchasing to legal affairs to financing and human resources. Audi, the VW brand, the trucks division, and the group's Chinese operations also have representatives on Volkswagen's top executive body. Publicly-listed companies in Germany have two management structures: one consisting of the management board around the CEO and a supervisory board that is made up half-half of labor representatives and members of the capital side to ensure even distribution of interests. Volkswagen is more complex than most of its peers, with the Porsche-Piech families de-facto controlling the manufacturer and the state of Lower-Saxony -- home to the company's headquarters and VW's main factory -- owning 20 percent. Tensions flared in recent weeks between Mueller and Lower Saxony's leadership, which is represented on the supervisory board. Mueller told German magazine Der Spiegel in March that he "doesn't like politicians meddling with my business," likening a discussion about a salary cap for executives to the oppressive system of the former German Democratic Republic. Mueller's total compensation was more than 10 million euros last year. Mueller's comments exhibited "a lack of sensitivity at a difficult time for VW," Lower Saxony's economic minister Bernd Althusmann, who also sits on VW's supervisory board, told German daily Hannoversche Allgemeine Zeitung. Lower Saxony played a key role in pushing for Mueller's replacement, arguing that his public comments were not helping the automaker win friends, the people said. Among other proposed changes, VW is also looking at replacing personnel director Karlheinz Blessing with Gunnar Kilian, a labor representative who is close to works council chief Bernd Osterloh, the people said.